Tomorrow is Friday Night….what shall I do?…..hmm….I know go to the Satellite and see my boys Wires In the Walls!! 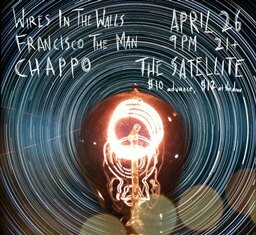 That’s right the guys from Wires will be sharing the stage with the New York band, CHAPPO and fellow LA band Francisco the Man. Haven’t seen Wires In the Walls play since their residency back in February. It’s been LONG overdue! I need so hear some ‘In the Rain’….love that song!! Remember WITW have a new EP that’s a MUST have called ‘LEAP, TIMBER, LEAP’. In all seriousness its a great EP – I felt as though they’ve grown as musicians and songwriters. And considering I already loved their stuff you could imgaine I was a happy mess when I listened to Leap, Timber, Leap.